The decorative framed panels aligns the headboard with the inset panel on the footboard drawer. This Broadmoore bed with pair of storage drawers exudes clean and classic ambience, while at the same time inviting relaxation and ease. The same bed is also available in California King size, Costco item #997672, with dimensions 94.7″L x 78.2″W x 64″H and priced at $699.99. This Broadmoore collection comes with King Bed, Nightstand, Gentleman’s Chest, Lingerie Chest, Media Dresser and Cheval Mirror which are sold separately. Currently they are only available at warehouse. Inventory and pricing may vary at your warehouse location and are subject to change. Broadmoore is a custom furniture line carried by Costco and provided by Universal Furniture which is owned by Samson Internationl, one of the top 10 makers of wood furniture in the world. Finely crafted with hardwood solids and hand selected veneers, each item is constructed with attention to individual detail from its' state–of–the-art factory. Style meets function, price doesn't cheapen the product. Good affordable smart design allows Universal Furniture to bring you the best product in a style that fits your life. 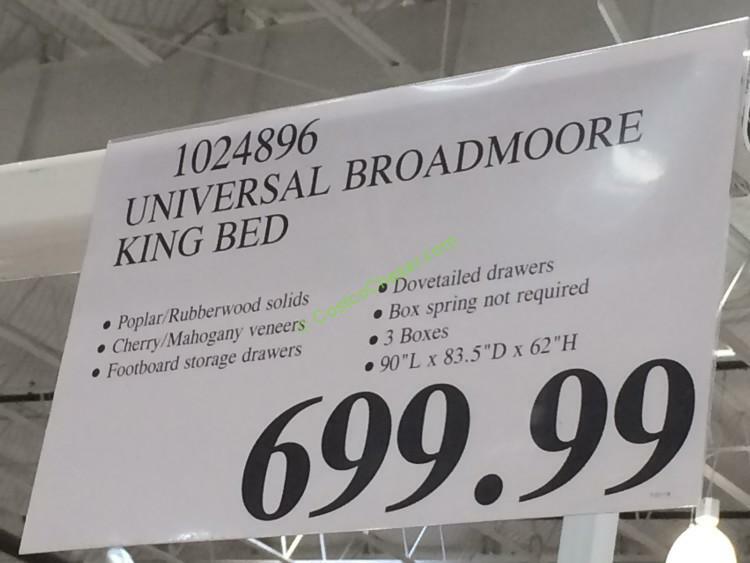 Does anyone have the assembly instruction manual for Universal broadmoore king storage bed? Can you please let me know where I can find it? It does have a strong smell. I have refinished furniture using stain and varnish. It has never smelled this bad or lingered for so long. I am so glad this is in the spare room. I could not sleep in there. If it was easier I would take the entire set back also. The furniture is beautiful but the fumes are horrible. I have had it for a week now and the fumes can still make your eyes water. During the day when it is warm, I leave the windows open and close the bedroom door. I should have paid more attention to the comments people were making. We just inboxed the Gentlemen’s Dresser. The smell is very strong and it is not a cedar or wood smell. I really like everything about the dresser but the smell may be too much. Bought Queen Bed, Gentlemen’s dresser, & 2 night stands. I was concerned about the toxic fumes but I really liked the style. Great news – little fumes went away after 1 day and the packaging was unbelievable. Absolutely came in perfect condition. Extremely easy to put together – all screws etc needed are included and well marked – only needed a Philips screwdriver. I am a female and had no trouble. So I am very happy I purchased the set – it looks great. Ian is spot on about the toxic fumes emitted by the universal queen storage bed (sleigh bed). The fumes are overwhelming. The bed looks nice and seems well built, however one month later out of the box and we still cannot sleep in the bedroom even with the window wide open. Good thing we have spare bedroom. Symptoms are indicative of formaldehyde poisoning including headaches/migraines and nose/throat irritation. Moved it to the garage and can still smell it just walking by. It is criminal for Costco to sell this toxic item and it should be recalled. Similar to the lumber liquidators case. Calling Sampson Int. does no good. They point out it is not harmful (obviously NOT!) and live with it or return. What a nightmare. Huge hassle. Beware! is it possible to buy the store display and buy the wooden slats that connect the headboard to the footboard?? 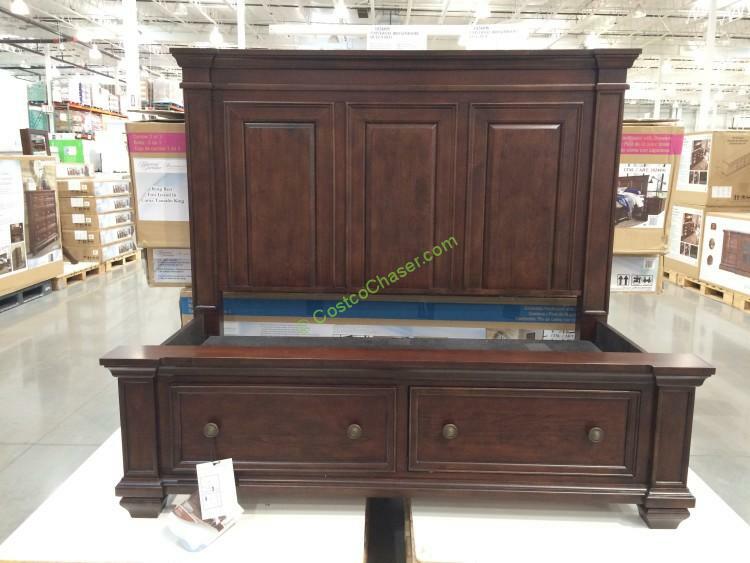 Need a lingeree chest and night stand? Live in South bend In…. Yes, I need a iingerie chest – do you have one? We just purchased the set and went back today for the lingerie chest and it was gone. Where can I purchase one? I saw the lingerie chest in my local store in east hanover NJ but I want to know where I can find the other pieces nightstands and dresser? available somewhere for this collection ? if so where?? I really want a Full size bed since I already have the matress, however it is really hard to find quality like this. Any ideas on whether the Full mattress will work ok with the queen bed? Dimension are supposed to be the same length and only 6 inches thinner. 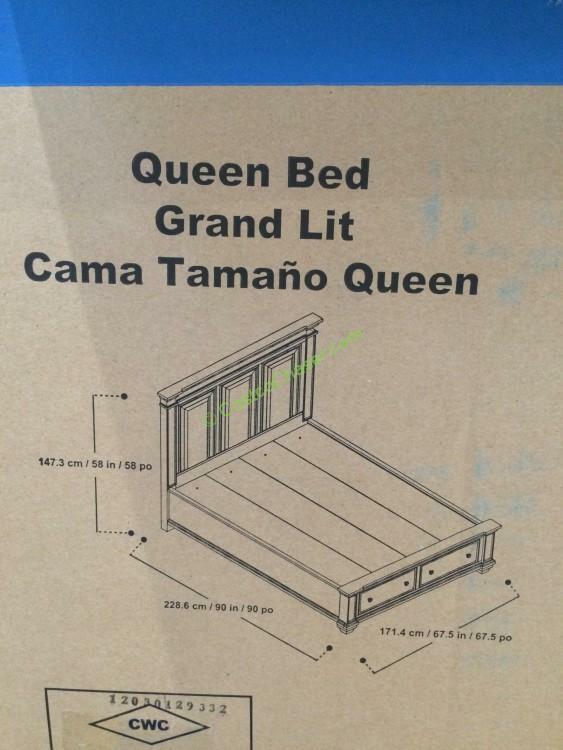 I want just the queen bed, but can’t find it in my local Costco. Does anyone know of one in their local costco? In addition very little smell, no more than with any other new piece of wood furniture manufactured painted and/or stained that you would buy anywhere. I was worried from a previous post about the smell, but my wife and I have had no issues of any kind in handling the wood pieces or smell. Very satisfied. Extremely well engineered, solid and very easy to assemble. 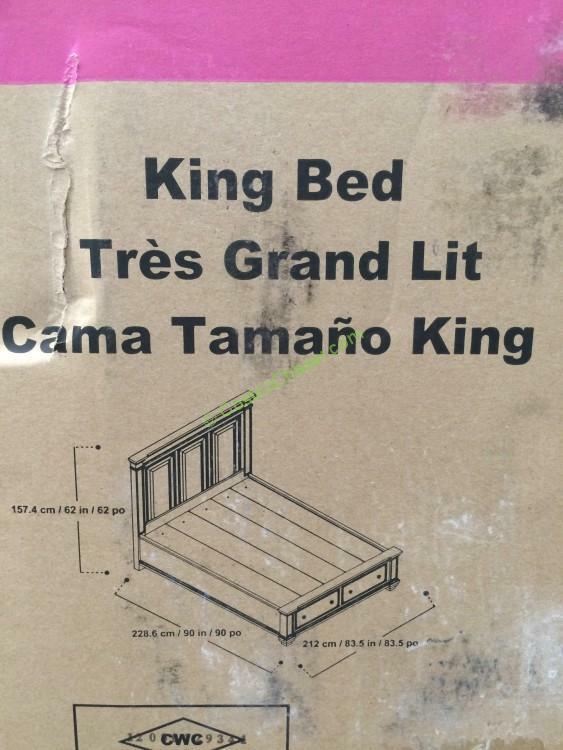 We are looking at this bed, but the King (item #1024896) dimensions look like Eastern King, not Cal King. Can anyone verify? Please do not buy if you are concern about formaldehyde and other banned chemicals used in Chinese made furniture/this set of bed frames/chest etc. I unfortunately bought the whole set from Costco and now my family is suffering nose bleed/headache/dizziness/cough/skin(irritation- rash on contact to the side rails of the bed as well as the foot end of the bed; the children sat there watching the entire Nemo animation). The fume is just nasty and intolerable. I have been using three box-fans to blow the air outside on the windows for a week now with little to no help because the smell is literally infused in the pieces of bedroom furniture. Spending half a day moving/assembling these pieces and I am contemplating returning the whole thing back to Costco and get my $2800.00 back! Chinese made drywall problem now furniture, never again!!! Thank you so much. Hubby and I were just looking at this furniture but there is no dresser with mirror sold with this group. Now that I have read this, this is good information about Chinese made furniture. I did not see your post. I wish I had. The smell is awful and I am returning the product tomorrow. Fortunately, I haven’t taken mine out of the box yet….just opened it and the smell over whelmed me. Don’t buy this product!!! Can you let me know if this set is still available in the Queen bed, gentleman’s chest, nightstand, and mirror? I found it at my local Costco warehouse but not online so I think you will just need to check around. I want to know if there is a dresser that Broadmoor sells for this bedroom set? 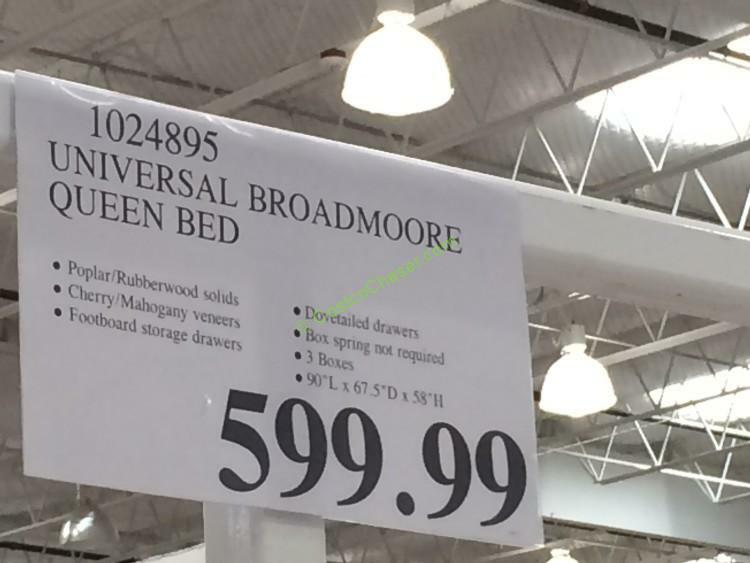 Where can I find the king bed Costco recently had on sale? Universal Broadmoore brand. I have one, 3 months old. Want to downsize to queen. Divorce.